Green tea, native to China and India, has been praised for its health benefits for centuries globally, but has only recently gained popularity in the United States. 78 percent of the tea consumed worldwide is black and only about 20 percent is green. All types of tea, except herbal tea, are brewed from the dried leaves of the Camellia Sinensis bush. The level of oxidation of the leaves determines the type of tea. Green tea is made from unoxidized leaves and is one of the less processed types of tea. It therefore contains the most antioxidants and beneficial polyphenols. Tea is rich in polyphenols that have effects like reducing inflammation and helping to fight cancer. Green tea is about 30 percent polyphenols by weight, including large amounts of a catechin called EGCG. Catechins are natural antioxidants that help prevent cell damage and provide other benefits. EGCG is one of the most powerful compounds in green tea. It has been studied to treat various diseases and may be one of the main reasons green tea is so healthy. Green tea does more than just keep you awake, it can also make you smarter. The key active ingredient is caffeine, which is a known stimulant. It doesn't contain as much as coffee, but enough to produce a response without causing the effects associated with too much caffeine. Studies suggest that green tea may boost your metabolism and help you burn fat. Much of this effect is likely due to caffeine, but other compounds in tea may also contribute to this effect. By helping you selectively burn the fat you have stored in your body for energy, green tea may help you feel fuller and maintain a steadier energy level, resulting in less hunger cravings and less calories consumed. Cancer is caused by uncontrolled growth of cells. It is one of the world's leading causes of death. It is known that oxidative damage contributes to the development of cancer and that antioxidants may have a protective effect. Green tea is an excellent source of powerful antioxidants, so it makes sense that it could reduce your risk of cancer. 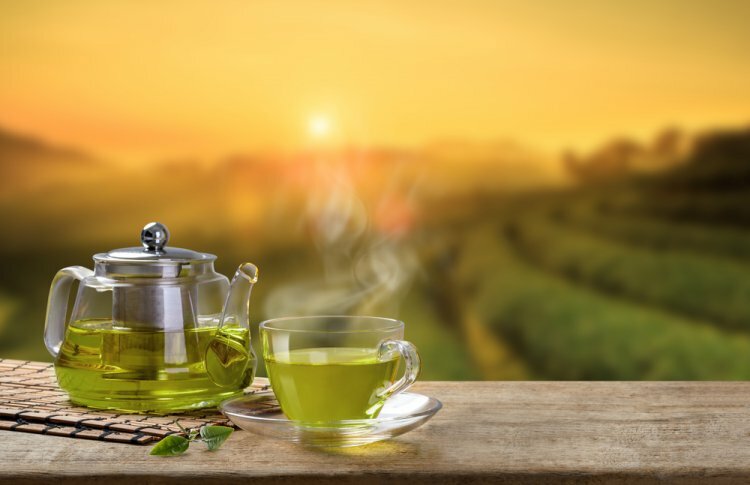 Multiple studies show that the catechin compounds in green tea can have various protective effects on neurons in test tubes and animal models, potentially lowering the risk of Alzheimer's and Parkinson's. Some studies show that catechins in green tea can kill bacteria and inhibit viruses like the influenza virus, potentially lowering your risk of infections. Green tea consumption is associated with improved dental health and a lower risk of caries. Multiple studies also show that green tea can reduce bad breath. The tea you use, temperature and steeping time all have a significant effect on the antioxidant levels of brewed green tea. Warm and ambient temperatures are the best to retain antioxidants. Let the boiling water cool slightly before pouring onto the tea leaves, and allow it to steep for between 2 and 3 minutes.